Halloween Pancakes – Grain-free, Gluten-free, fluffy and tasty! I love new recipes, and since so many are looking for grain-free, gluten-free foods these days, these pancakes will hit the spot. It all started with this recipe from Katie on how to get more vegetables into your kids, only I adapted it of course, because I can't help it! In a separate bowl, mix the following well: yolks, squash, flour, maple syrup, vanilla, spices, salt, and baking powder. Carefully fold in egg whites. I cooked them in my favorite stainless steel electric pan in bacon grease, or ghee is good, too. Brown well on each side, serve with plenty of butter and real maple syrup. Makes 16 silver dollar sized pancakes. I live in Iceland and I haven’t found pureed butternut squash and stores don’t always have butternut squas. Can I use appelpuree instead? Arrowroot, I have heard a lot about it… How does it taste? These look amazing! I’ve been on a squash and pumpkin binge lately so this will give me something new to try. Thanks for this! I didn’t know what we were having for breakfast this morning but had leftover betternut squash in the fridge. These were great. I LOVE the name! I will definitely try this. At least one of my kids might think it’s cool. Perfect timing. I suppose they could also be called pumpkin pie pancakes. I usually freeze leftover cooked pumpkin and other squashes in 2 cup servings. Once I needed to bake pumpkin pies for Thanksgiving but I only had enough pumpkin for 1 pie. I found enough butternut squash in the freezer for another pie. The butternut squash pie won the taste test. I found out a long time ago that pumpkin is lower in carbs than some other squashes. I do love butternut and acorn. Pumpkin tastes just as good. Nice! This recipe is very similar to the nut butter pancakes from GAPS. You use about equal amounts of squash (roasted or steamed, then pureed), nut butter (anyone works: almond is nice, peanut can be a vit overpowering, macadamia would be to die for!) and eggs. You can add cinnamon or other spices and a bit of honey, if needed. Baking powder would be illegal but baking soda is fine. 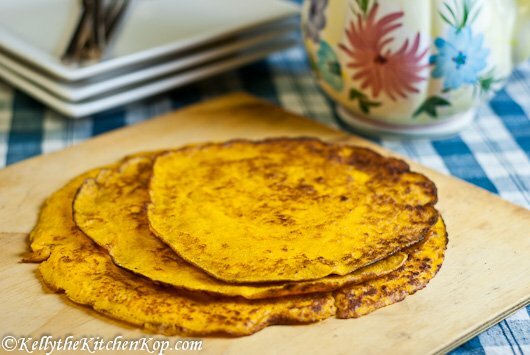 I make these all the time with butternut, acorn or kabocha squashes – each one is different but they’re all good!! I barely use any honey in them batter and each them with butter or coconut oil. Yummy! Can you make this with acorn squash? A friend of ours had a bountiful crop and my counter is blooming with acorn squash. I don’t know why not! It just may not be quite as sweet, I think Butternut is a little sweeter. Guess I’ll have to give it a try. The last acorn squash I made for dinner was so sweet I could hardly eat it – weird, isn’t it? 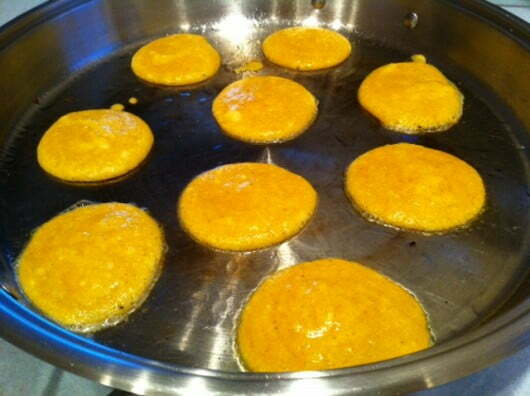 Like I posted below, I make my pancakes with acorn, kabocha or butternut squashes. They all work well. You may have to adjust the amount of eggs as each squash’s texture is a bit different.